Japan Amusement Expo (JAEPO) is one of the largest amusement machine and equipment exhibitions in the world. The tradeshow gives industry members, business owners and the public an opportunity to try out the latest amusement arcade games and machines. Of the three day event, the first day (February 10) can only be entered by industry staff with business admission tickets. The second and third day (February 11 and 12), however, are open for public attendance. 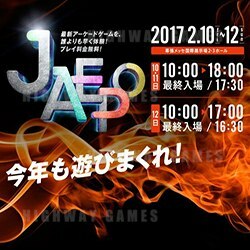 JAEPO was created by the merging of the AOU and the JAMMA shows in 2012. Products and services displayed at the event include: coin-op, arcade game machines, amusement rides, play equipment, redemption prizes and machines, and equipment relative to the amusement and arcade industry - i.e. vending, cash and card systems, food and beverage.